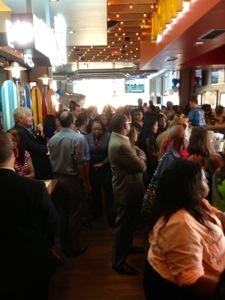 Joe’s Crab Shack will open its first NYC store in Harlem today, line to enter started last night | HarlemGal Inc. There is a long line at 126th Street and Frederick Douglass Blvd in Harlem-and it’s not for concert tickets to a show at The Apollo. Harlemites started lining up last night to be one of the first customers to dine at Joe’s Crab Shack in Harlem, which opens at 11 am today, July 30. The long line at Joe’s Crab Shack started last night. Why? The first 100 fans that dine at Joe’s on opening day will win free crab for a year. In addition to prizes for the first 100, all guests who dine at the restaurant on opening day can enter to win additional prizes. 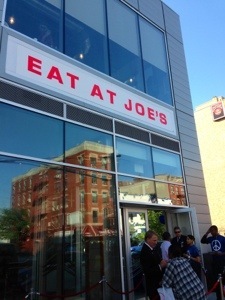 I stopped by the new Joe’s last night for their VIP party in Harlem. The place is very nice and huge! 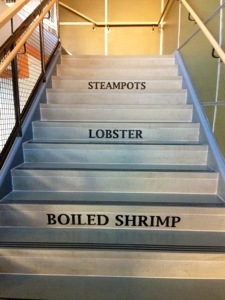 It’s a 10,000-square-foot restaurant on the second level at 2349 Frederick Douglass Blvd. The new Joe’s Crab Shack can accommodate 380 guests and will employ more than 200 team members from the Harlem area, according to Councilwoman Inez Dickens, who gave the figures at last night’s party. I also learned an interesting tidbit about Joe’s Crab Shack. I had asked about their presence and experience in urban areas. After all, Harlem is their first location in New York City. I was pointed to a recent study conducted by New Media Metrics, which recently surveyed 3,400 African-Americans ages 13 to 64 about brand-related attachment. Joe’s Crab Shack was one of the brands in the restaurant category that made “the biggest gains in terms of positive awareness among black consumers.” Here’s an article about that study. I do plan to check out Joe’s Crab Shack in Harlem soon, but not today because I have this gut feeling they are going to get hit with customers like a tidal wave. Hope they came with enough crab! This entry was posted in Harlem and tagged 10027, 125th street, Frederick Douglass Blvd., Harlem, Harlem Blogs, harlem restaurant row, Harlem Restaurants, Harlem's Restaurant Row, joe s crab shack, Joe's Crab Shack, Joe's Crab Shack Harlem, where to dine in Harlem. Bookmark the permalink.